We have a currently funded project that is just getting off the ground to look at patterns of gene flow in the 6 species of bats that occur in the Bahamas. This project seeks to explore the extent to which narrow oceanic straits present barriers to gene flow. We are using a multi-locus data set to estimate changes in effective population size over time and patterns of gene flow. Coupled with the niche modeling data shown below, we can generate testable models of bat evolutionary history in the Bahamas using coalescent simulations. These simulations will allow us to determine which evolutionary models are most likely to produce the kinds of molecular data we observe in modern bats. 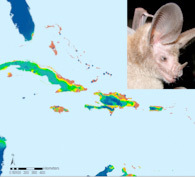 This also allows us to predict how future climate change might affect Bahamian bat populations. Ecological niche models are routinely used to not only generate predicted distributions for species at the present time, but they are also used to generate past species distributions (e.g., those at the last glacial maximum). There has been a disturbing absence of testing to determine the degree to which these models accurately predict the past distribution of species. We are using the bat species of the Bahamas as a test case whereby we are generating predictive models of species distribution using various methods and testing their accuracy based on the fossil record of bats from the Caribbean. 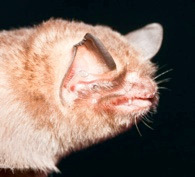 This study involves considerable field collection, computational effort (niche modeling), and molecular data analysis (to define taxonomic boundaries for niche modeling). 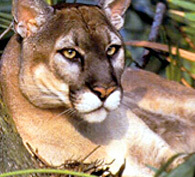 The Florida Museum receives all of the Florida Panthers that are found dead from various causes (e.g., hit by cars, male/male aggression, etc.). Therefore, we have an amazing resources of over 100 FL Panther specimens that we can use to address various questions about diet and health. We have examined the osteopathologies that these cats suffer from (likely the result of severe inbreeding) to track changes in severity and prevalence over the past 50 years. We have also used stable isotope geochemistry to examine panther diet, which seems to vary in ways that we didn’t expect. This work has been submitted to the Florida Museum of Natural History Bulletin. Check the web site in the summer of 2007 to find this work. 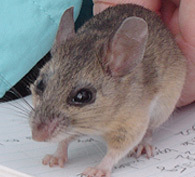 The Florida Museum of Natural History has an outstanding collection of the monotypic Florida Mouse thanks to the collecting efforts of Jim Layne and others. We will be looking at the population genetics of the historical populations sampled from within our collection, and our collaborator, James Austin, will be sampling current populations for comparison.